Some people's beauty obsessions are obvious early in life. For my best friend, Katie Reed, and me, it was definitely nail polish. We've been in love with cool, bold colors since the early 90's -- we used to trade them back and forth while sitting in our high school hallways before class. For the next 12 days, we'll be bringing you some of our favorites in what we're calling 12 Days of Favorite Nail Colors. Today we're all about green! Call it Christmas spirit if you will! 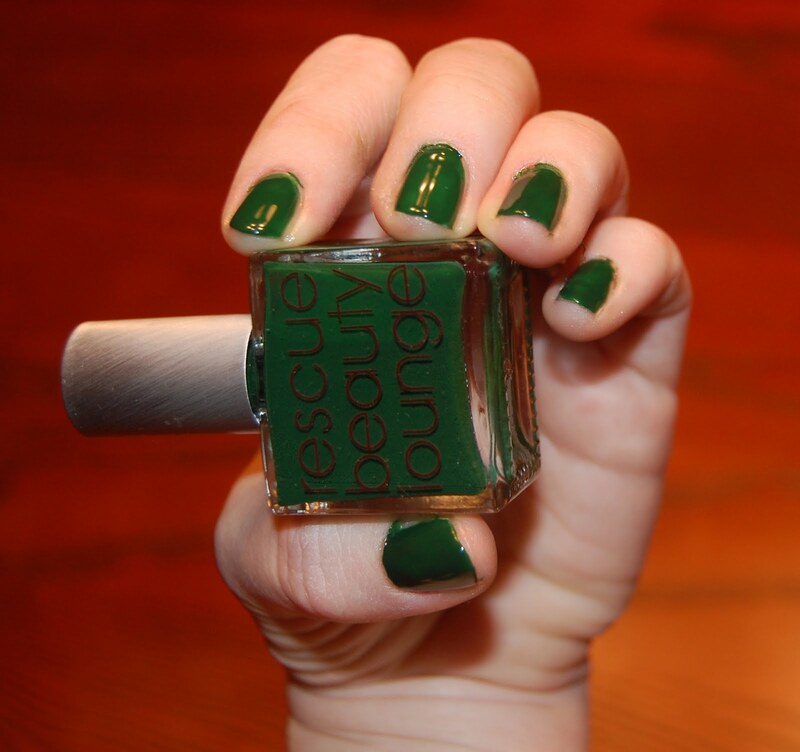 Jamie: My color today is China Glaze Emerald Sparkle. This is another color from 2009's Wizard of Ooh Ahz Collection, just like Ruby Pumps. And, just like Ruby Pumps, it holds a special place in my heart. I absolutely love the rich shade of emerald and the immense amount of shimmer packed into the formula. It applies fantastically -- one coat is enough to cover the nail, although I always go with two for a little bit more oomph. And it's just PERFECT for the holiday season! Note: Unless you're lucky enough to find this color on eBay or in a beauty supply store, it's no longer available. Katie: Years ago, Jamie and I were at Louis Boston, eying the beauty products, when I was stopped in my tracks by Rescue Beauty Lounge Recycle. Creams aren't my favorite polishes, but this strongly pigmented shade sent my green-loving fingers reaching for my credit card. This polish can be a one-coater if you set your mind to it, but I used two just to make sure I had full coverage. I love that this color is actually forest green, instead of black which might look forest green in direct sunlight. Those types of lacquers are nice, but when you live in the northeast, there isn't a lot of direct sunlight to be had! Rescue Beauty Lounge Recycle is available at rescuebeauty.com.